Rider Josh Newman celebrated his first winner at The Festival when 8/1 chance Midnight Prayer landed the Terry Biddlecombe National Hunt Chase by a neck for trainer Alan King. 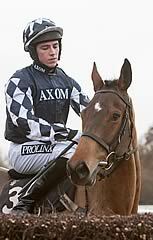 Newman, who hails from a Somerset family steeped in farming, hunting and point-to-pointing, turned 22 yesterday. He said: "It doesn't get any better than that - he jumped and travelled and I could put him where I wanted to and he did everything right, including a brilliant jump at the last fence. "Alan told me to jump him out and be handy and not to panic if it took him time to warm up, but there was no problem with that today. He jumped the first couple and was soon into a lovely rhythm. He bounced off the ground and handled it, although I thought he might need it softer. "There was no doubt he would stay four miles. He ground out victory at Warwick last time and he jumps so well. You could put 50 fences in front of him and he would jump them all. He's so accurate for a big horse. "It felt like a long run-in, and I could feel other horses coming in, but I could feel my horse pulling out more. I didn't dare look across but I was glad when the line came. Now I want to make the most of this success because it might never come again. "I grew up in Somerset and didn't have much interest in horses when I was young, but at 12 I went hunting and wanted to stay out all day. Then I went pony racing and eventually got into point-to-pointing. "At 16 I started working for Alan and I was 22 yesterday, so that's a really nice birthday present." Newman was enjoying his fourth winner under Rules and his second at Cheltenham having partnered a hunter chase success at the venue. Ironically he has yet to ride a point-to-point winner this season, but this weekend he continues his pursuit when riding at Wadebridge in Cornwall and Buckfastleigh in Devon. The 8/1 shot Midnight Prayer had been progressive over fences this season, winning twice including at Warwick last time out, and showed just how far he'd come by resisting the challenge of runner-up Shotgun Paddy to record a neck victory. Trainer Alan King won this race in 2008 when Old Benny won for owner Trevor Hemmings and the Barbury handler was relieved to have got off the mark for The Festival on the first day. "He's done it very nicely," said King. "I always thought that this sort of trip would suit him and the drying ground has been a big plus as well. I always thought that if he ran well here then the Scottish National could be an option and I've no reason to think any different now. "He's a thorough stayer and he's by Midnight Legend, who we've had a lot of success with over the years. "It's always nice to get one on the board on the first day of The Festival. I've had six runners today - some have run well and some haven't but I'll definitely sleep better tonight as the pressure is off a bit." Emma Lavelle is hoping that 7/2 chance Shotgun Paddy will develop into a Grand National prospect after the seven-year-old finished the neck runner-up today. "He just didn't get away from the last fence very well and that cost him. I just wanted the winning post to be three strides further on," said Lavelle. "He ran a fantastic race and Derek O'Connor gave him a lovely ride. "His jumping wasn't as good as it has been today but I think that's because he just doesn't have time to organise himself at the fences on this livelier ground. He's a lovely horse for next year and ultimately he will hopefully be a National horse." Owner Barry Connell is convinced Foxrock ran below his best today. The Ted Walsh-trained six-year-old was sent off the 3-1 favourite for the four-mile contest but could only finish ninth. While Connell does not necessarily blame the ground for his poor display, he is only likely to run at the Punchestown Festival if rain arrives. "It's hard to know why he didn't perform," said Connell. "I don't think the ground was necessarily an issue. I don't know whether he stayed or not, but I think it's safe to say he didn't run up to his best. 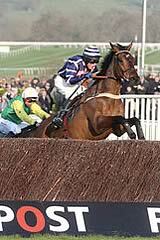 "He'd been very consistent going into Cheltenham, winning his two Grade Twos. "I'm not sure what the plan will be for him now. It will all depend on the ground. "He has already achieved a lot, so I'm not too bothered if he doesn't run again this season. "Having said that, if Punchestown get plenty of rain, we could think about running him there, so we'll see."